China’s Ju Wenjun has won the Women’s World Championship title for the second time in six months after defeating Kateryna Lagno in tiebreaks in the final match in Khanty-Mansiysk. 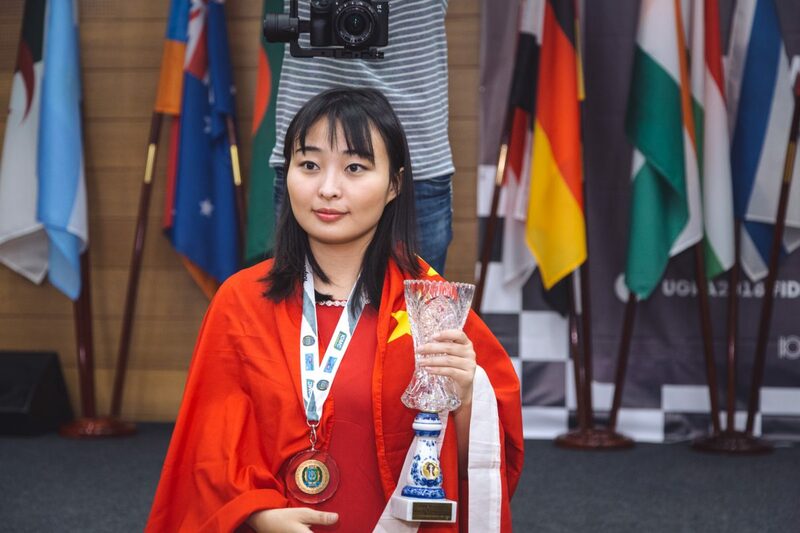 After first gaining the title by beating Tan Zhongyi in a match in May the odds were that she would be one of the shortest-lived champions in chess history, but instead she battled through the 64-player, 20-day knockout to retain her crown. In a wonderful year for the women’s no. 2 she also won double gold with China at the Olympiad. Ju Wenjun remains the 17th Women’s World Champion after going through an ordeal that no champion in the near future is going to face. 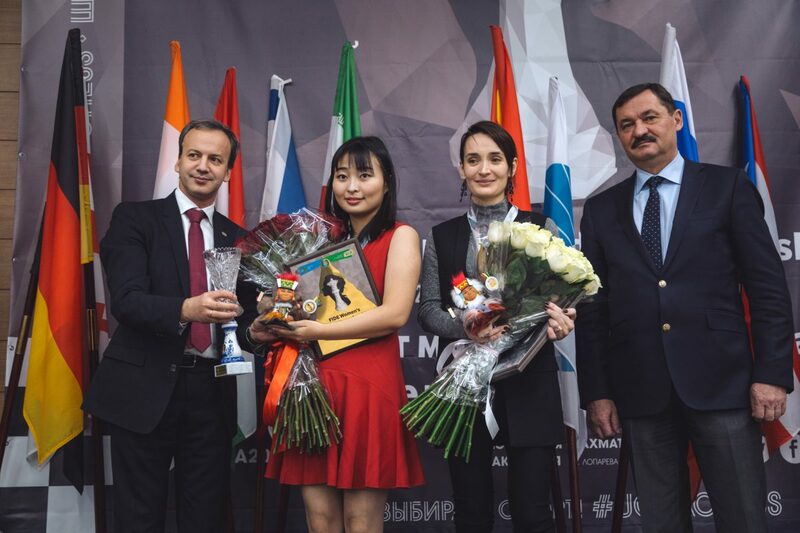 She had to enter the big knockout without any privileges, while in future the women’s cycle will change to mirror the overall World Championship, with the title-holder playing a match against a Candidates Tournament winner. 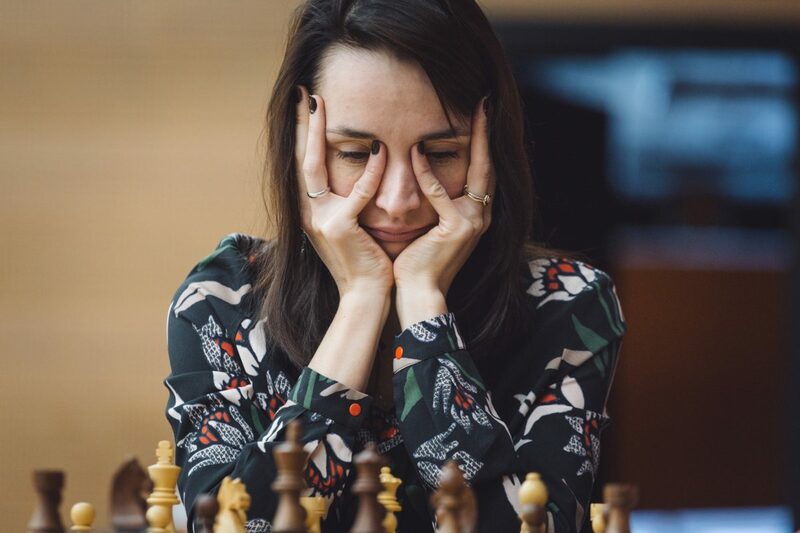 The 4-game classical match started badly for the Chinese player against Russia’s Kateryna Lagno. 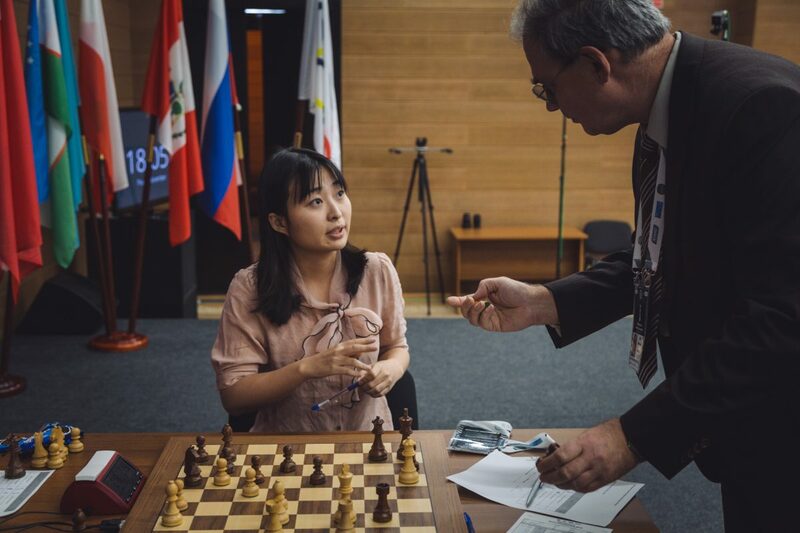 An extremely complicated and double-edged fight in the first game seemed to be going Ju Wenjun’s way until one careless move squandered much of her advantage in mutual time trouble. She then instantly offered a draw in a position where she could have fought on for a win at little risk. Kateryna said that after e.g. 20…Rd5 it should just be equal and the players would go home, but she felt her opponent underestimated the danger, and that after 20…Rxd1 21.Rxd1 Rb8 22.g4! it was already difficult for Black to defend in a practical game. Kateryna went on to win in 59 moves. 21.Ne6!? is playable here, but it’s much more powerful to play 21.fxg4! first, when 21…hxg4 22.Ne6! is crushing with the f-file open and Bxg4 threatened. 19…c4! would have been a cute winning move, with that one pawn jab leaving both white knights en prise. It seems 20.Nxg6 Bxd5! 21.Nh4 might save the day, but after 21…Bf6! the knight is lost due to the pin down the g-file. The cold-blooded 28.Qh5! still holds, computers tell us, but after 28.Kh1? Bc8!, re-routing the bishop to smoke out the king on h1, it was game-over: 29.Qh5 Bb7+! 30.Kg1 Rxg3+! 31.hxg3 Rxg3+ 32.Kf2 Rg2+ White resigns. It’s mate-in-2, and that meant the match was going to tiebreaks. To draw here it would be sufficient to play, for instance, 23.Bxb2 and no-one is winning that opposite-coloured bishops ending, but after the careless 23.Bf1?! Nd1! White was losing the f2-pawn. Even then the game should objectively have been drawn, but Ju Wenjun went on to grind out a win and take the lead in the match for the first time. 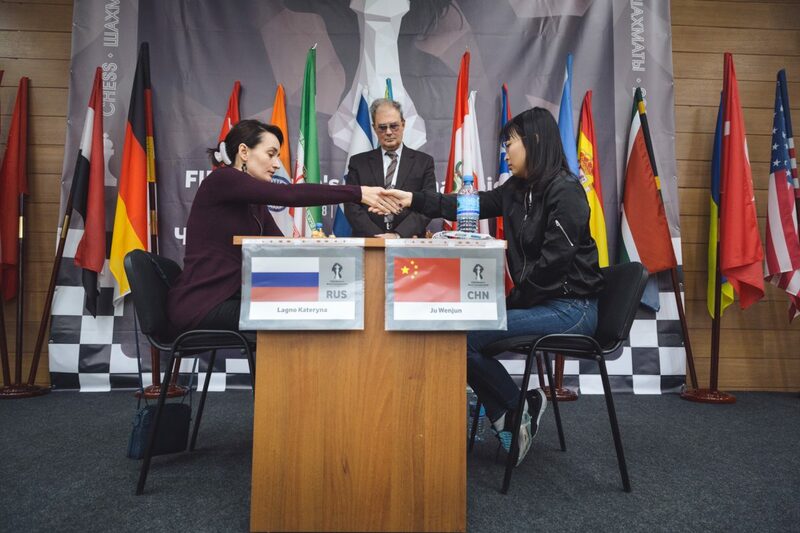 Ju Wenjun was of course delighted, and added in a short interview afterwards, “It’s a very good thing that the Women’s World Championship is going to be like the men’s”. 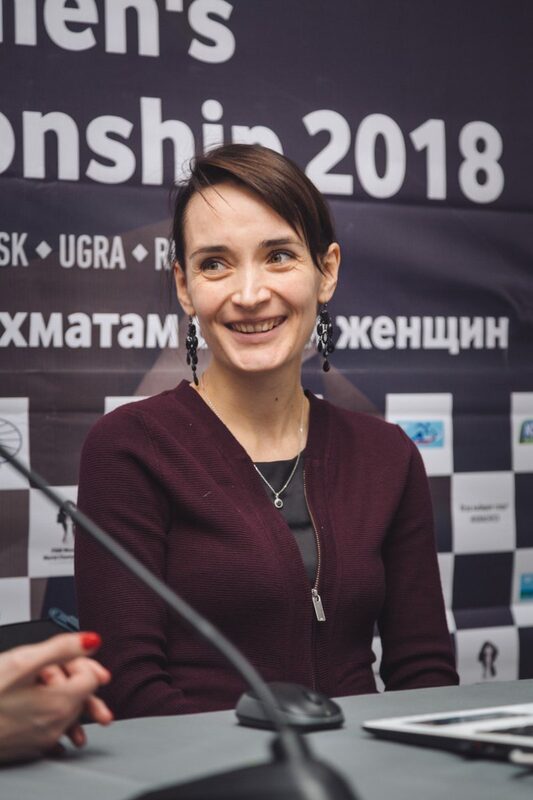 We already knew there would be an 8-player Candidates Tournament next year between the semi-finalists here (Kateryna Lagno, Alexandra Kosteniuk, Mariya Muzychuk), and players selected by rating, to determine who would play a match against Ju Wenjun. Let's hope that tempts Women's no. 1 Hou Yifan back into the cycle. Arkady added the extra details that in the next cycle the knockout will return as a World Cup, which will be combined with a Grand Prix series and players selected by rating i.e. exactly how the overall World Championship cycle has operated in recent years. Finally, then, Ju Wenjun can relax and enjoy some time without having to defend her title. Or at least she can relax after playing in the final four rounds of the Chinese League - that begins on Tuesday!